I like the look, and I’ve tried it before, but I think the pants are too small, both for comfort (you can’t be constantly pulling them away from your crotch to make them look flat) and to reasonably cover the shoes. I love how he pulls off a completely mundane outfit that you can see at any given small town in the USA. Phenomenal. More please. Classics with a very charming twist! fitting for the quite prince street shot. Very nice…because this is exactly how I dress! Except I prefer boots to shoes. I even think he got the same shirt as me. That look is great – Scott probably posted this because he loved the length of the trousers, but I think his haircut is what pulls it all together. He looks like a sweet good boy…funny and very attractive in a way ! Not so sure the pants length has been consciously chosen…sort of “default” dressing, no? I went to college with this kid in Santa Barbara. He has a charming English academic look (I will resist saying Harry-Potter-like), as though he’s taking a small break, and about to return to the lab to continue his post-doctoral research. I think he’s very well put-together, and his pant length would drop a smidge, to where it should be, when he takes his hands out of his pockets. Very nice intensity. yawn….not sure i see the fuss. there isn’t that one little detail that sets him apart if you ask me. this is SUCH a great look. it’s what all the hipster boys will do when they realize that you can’t make a living off being young, and yet he doesn’t look old in it. it’s fantastic. He looks fantastic. I love the length of his pants and the colors he chose, low-key but he’s got a dignified look about him. i want to marry this man. this is what my dream husband looks like. *sigh* thank you. Notthing new…but it’s a very…very cool style. Indeed a classic one. Nice pic though. I love it! I’ve been seeing a lot of people subtly co-ordinating neutrals. 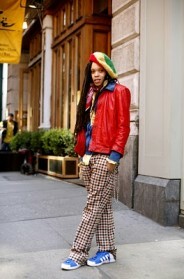 Its a really good look, and the suede shoes add a touch of english retro-swot. For all those that mentioned ‘english / british’ style or influence … i’m sorry! i have nvr once seen any guy dressed like that over here … we have young style, not old man style … totally boring, totally mundane, totally forgetable! Great length on the trousers, very european! I would love to see more American men dressed like this. To anonymous – I am from UK – and you’re talking cobblers old bean. Total hogwash. 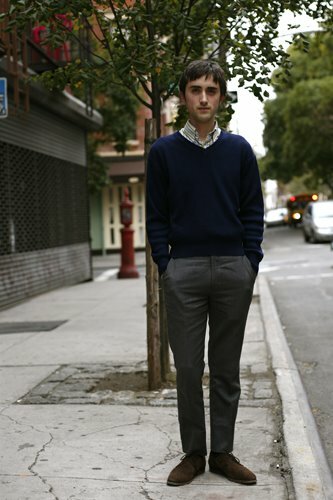 This well dressed (okay slight banal but still spiffy) fella is typical of many a Brit. Actually it’s a new-classic style that stretches back to the Mods in the 1960s. I attended school in 1980s with a whole classload of similar dressed types. All he needs is a green army parka jacket and a scooter and he fits right into the Mod look. Also see The Jam band from UK in 1980s – same look etc. Not my cup of tea – but for some a very tidy and nifty way to go. Still very fashionable too. I like how he is standing. “Posture as accessory” – would fit this photo too. it’s definitely the combo of the outfit + the hair together, reminds me of quadrophenia. It’s the fact that the pieces are very basic, but tweaked in the proportion. I have to disagree with the third comment – I wish I could see this look in ‘any given small down USA.’ That was possible once (mid to late 60′s) but I only see this look in NYC/London/Paris. I love the length of his trousers also, but the only problem is the way the average American has been “trained” to dress, most would deride them as far too short. Could I pull off this trouser length? Sure. Would I feel confident, maybe not since I would assume everybody who saw me would be thinking “poor guy, he mustn’t have a wife to tell him his trousers are too short…”! Is this the Prince of Prince Street? Perhaps! This dapper gent reminds me of a young Gerard Depardieu. Tres chic! Tres elegant! I wonder what this man is holding in his pockets? I would guess the Kinks box set, a ticket to a Who concert, and a paperback copy of Nicholas Nickelby. Like Mona Lisa’s smile and the location of the Sasquatch, we will never know! And terrific use of a school bus in the background, to boot! He is so cute, I’d love to take him home . . .
It’s the rosy cheeks that make this look for me. I love the guesses about what he might have in his pocket. I believe irish eyes is right – but I would extend that to much of Northern Europe. My husband, who grew up in Switzerland and Austria in the ’80′s dresses exactly like this (and it does somehow make him seem younger than he is). He has always kept his pants cut close, and a touch shorter than most. He is concerned with color, texture, and fit – and always has been! This isn’t old man style, it’s just style. gives me a great idea for casual friday. Amazingly pixy-boy. I’d probably develop a huge crush on someone who looked like this in real life. wow nice shoes, where do I find ??? what pants is he wearing? Where can I buy pants similar to that? reminiscent of vampire weekend, no?